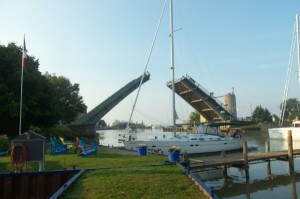 The King George VI Lift Bridge is your gateway into the charming fishing village of Port Stanley. The Bridge opens between 6am and 10 pm April to October. The Bridge Operator monitors channel 06. 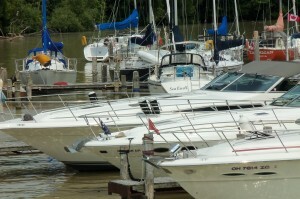 We can accommodate small groups of 6-8 boats, power or sail, to 50 feet. Most boats will have double 30 amp plugs with 2x 50 amp plugs available on our river docks. We take pride in offering clean, well maintained private restrooms and showers with a coin-operated washer and dryer available as well. Plan a cook-out! Your group can take advantage of our complimentary gas grills, picnic tables and lounge chairs. Younger guests will enjoy our two paddle boats to go exploring “up river” while boaters of all ages can vie for “best putter” on our small putting green. Whether its sitting in the sun with a cold one or relaxing in the shade under a majestic maple tree, you, your family and boating buddies will be able to unwind in your private oasis of Kettle Creek Marina. Later in the evening get out the s’mores as you swap tall tales around the campfire (wood provided) but please bring your own ghost stories!